This is a toast to summer. Fall began officially this weekend, and we toasted it with a bottle of dandelion wine from 2005. This is the longest I've ever waited to drink a bottle of home made wine. I'm not a patient person (can you say understatement? ), so wine making is probably not the best hobby for me. But it tastes so good. Leda insists that dandelion is a wine that REALLY benefits from age, so I waited. And waited. And this weekend Michael and Tom & Sue Kent, and I toasted the end of summer with a delicious glass of golden sunlight. It was worth waiting for and I wish I had more. But considering that each individual dandelion petal has to be removed from the calyx (calyces make the brew bitter), I'm grateful for even a single bottle. Grateful to myself, that is, since I plucked every last petal. So now it's fall and that means what? That's right...mushrooms! If summer means berries, then fall means mushrooms. It's been dry-ish so there aren't as many mushrooms as usual, but today we found a very young, very tender Chicken of the Woods. Gary Lincoff (my mushroom sensei) calls C o' the W a 50 mile an hour mushroom because you can spot it from the car as you speed down the highway. We were driving considerably slower than that this morning, so I had no trouble spotting it from the passenger seat. 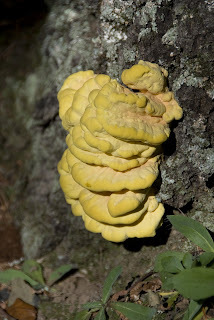 Usually the mushroom (a bracket fungus) is bright orange with a yellow underbelly. The juvenile specimen we found today is pale yellow, just beginning to blush orange. It's much more moist and softer to the touch than any chicken mushroom I've found before, and I know it's going to be delicious. Dinner tomorrow: C o' the W sauteed in butter with chives. If only I had a little more dandelion wine to go with. i've seen those, i've touched those, i've even shot quite a few ethereal photos of those...i have never eaten one of those and didn't know you could! love it!